7.1) Capture templates: Side by Side. All these different captures have been tested in: Autopano Giga, PTGui and Mistika VR. 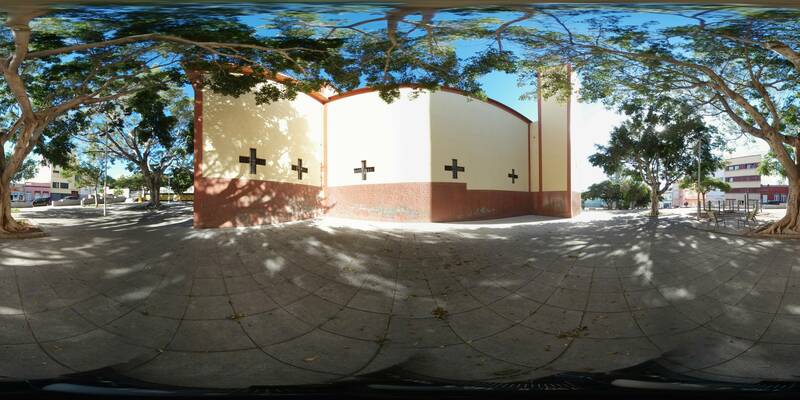 The photos are first stitched with PTGui or Autopano and then opened in Mistika VR to correct parallax/stitching errors. All these techniques are valid for the Nodal Ninja Stereo Kit. The minimum number of double shots to compose a stereopanorama is three, so this capture is the fastest possible, however the little overlap does not allow perfect stitching, so we will use this capture technique in special cases such as photojournalism. As we take a larger number of photos around, we get a larger overlap that translates into greater stereoscopic quality, so if possible, we will always try to take more than three double photos. This is a capture similar to the one made by the Vuze and DetuMax cameras. If we take more photos, we will realize that when we reach six the quality is correct, and will not improve if we increase this number. So far we have worked with only one row, but if we want to get an extra overlap in zenit and nadir we must make two rows, and this is where the two axes of motion of Nodal Ninja Stereo are effective. In total there will be 24 photos using a 60º rotation base. Using 10 or 12mm, we are going to increase the photographic resolution, and at the same time we are going to have an extra overlap in zenit and nadir.